DIY Cracker Box School Bus! My little one LOVES buses. LOVES them. 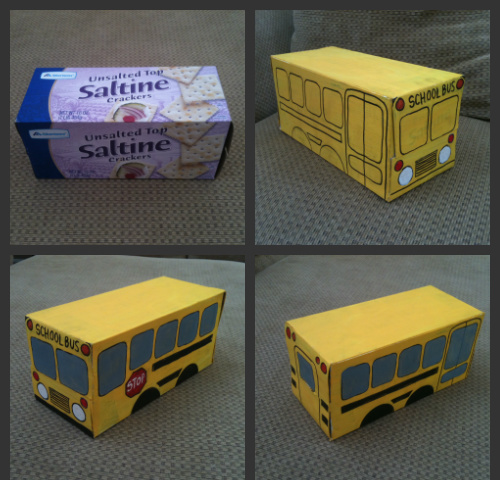 So we decided to get a little bit crafty and make our own yellow school bus from an empty box of saltine crackers. First, I taped the box closed and painted a coat of white craft paint onto the box. Then, I painted the box yellow. Second, I quickly pencil sketched the basic features of the bus and outlined with a black permanent marker. Third, we filled in the red lights and stop sign with a red marker. Fourth, we mixed a dab of blue and black paint into some white craft paint and painted the windows with a small brush. Finally, we painted the wheels and the belly of the bus with black craft paint. This is an easy and inexpensive project which is great for a rainy day! Oh my, this is so cute, I never would of thought of painting a cracker box, and then turn it in to a bus! You are pretty clever. Plus it looks pretty good considering you free handed the outline. Very cute. Thanks for sharing your creative inspiration at Sunday's Best Par.tay! I have featured this on my Facebook page. I just tried posting this on my FB page, and it is telling me your link to the post is coming up spam? Don't want you to think I did post. Never seen this before and don't understand. This is the message I get when I enter the post link: http://tracking.livingsocial.com/aff_i?offer_id=3&aff_id=4874. Just thought I would let you know. Your email comes back as full also. Sorry!